Like as the hart longs. Composed by Felix Bartholdy Mendelssohn (1809-1847). Edited by Gunter Graulich. This edition: urtext. 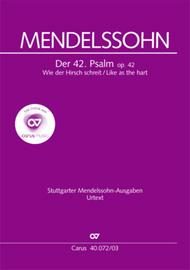 Stuttgart Urtext Edition: Mendelssohn. Der 42.Psalm/Wie Der Hirsch Schreit. Innovative practice aids, Sacred vocal music, Psalms, German, Trinity, Psalms. Vocal score. Composed 1837. Op. 42, MWV A 15. 36 pages. Duration 24 minutes. Carus Verlag #CV 40.072/03. Published by Carus Verlag (CA.4007203). The Psalms inspired Mendelssohn throughout his working life, and, aside from a cappella settings, he left behind five great orchestral Psalms. 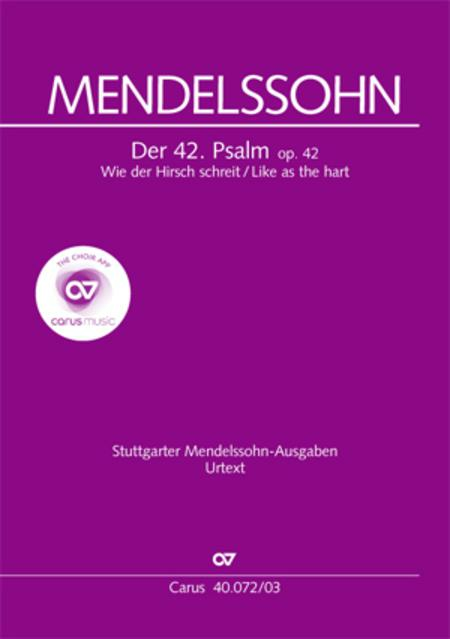 Schumann assesed in 1837 that Psalm 42 was the ""highest point that he [Mendelssohn] reached as a composer for the church. Indeed the highest point recent church music has reached at all."" This work is now available in carus music, the choir app! Score available separately - see item CA.4007200.